Cloverfield is the brainchild of J.J. Abrams. It plays something like this: Imagine a cross between The Blair Witch Project, a giant monster movie, the TV show Felicity, and a surprisingly large dose of the obscure 80s movie Miracle Mile. In a good way. In a very, very good way. WARNING: THERE IS NO WAY I CAN REVIEW THIS MOVIE WITHOUT EXTREME SPOILERAGE. PROCEED AT YOUR OWN RISK. The movie opens with a text informing you that you're about to watch the raw, unedited footage that was recovered from a camera found in the area "formerly known as Central Park." So right off the bat we know that, just like in The Blair Witch Project, things are probably going to end very poorly for the people manning the camera. The rest of the movie is, indeed, the raw footage from the camera, including bits here and there of what used to be on the tape before it was recorded over (a clever device that is used for tragic punctuation at times). The tape chronicles one night during a giant monster attack on New York City. Now, I've read several reviews complaining that there's no way that a camera battery could last twelve hours or however long it is from the beginning of the movie until the end (the attack doesn't start until 1:00 AM, but there are several hours of a party and party prep before that happens). But the movie itself is barely 75 minutes long. It isn't like the camera was kept on and running for the whole lenght of time that the movie spans. There are very obviously parts where the camera is turned off, sometimes for hours at a time. What kind of crappy camera do people own that doesn't have a 75 minute battery life? Jeez! Logic, people. Logic. Speaking of the camera, it's one of the best video cameras I've ever seen. What video camera do you know that has Dolby DDS Surround Sound built in? And also fantastic light/dark abilites and deep focus? The camera is held for 90% of the movie by a guy named Hud, who sounds almost exactly like that guy who used to be on Breaker High and is now Sock on Reaper. Hud isn't the brightest guy, and some of the things that come out of his mouth are where the comic relief in the movie comes from. And the laughs are usually nervous, tension-breaking laughs. Hud never tries to be funny. He's just overly earnest and questioning, and has that compulsion to fill up silence with inane patter. The other characters are less interesting, but the performances are, for the most part, rather good. They don't achieve the same level of realism as the Blair Witch group, but then again the actors in Cloverfield actually had lines written for them, whereas Blair Witch is this close to being an actual documentary. What I do like about the characters, though, is that they're all basically regular people. Felicity-style regular people, but regular people nonetheless. The film is told entirely from their point of view (literally, in the case of Hud). They don't know what's going on, other than what they see on a couple of newscasts and what they're told at one point by the Army people they run into (which isn't much). Indeed, thankfully we, the audience, never learn what the Cloverfield monster is, where it came from, or what it is doing. There are none of those lame, technobabbly sequences found in most giant monster movies where a scientist guy explains what's going on, what the monster is, where it came from, and (usually) what technobabbly weakness it has. We just don't know. And that inability to get any knolwedge makes the whole proceedings much, much more frightening. Let's be honest: have you ever actually been frightened by a Godzilla movie? The giant monster in Cloverfield is not, unfortunately, Gojira, Godzilla, nor any other pre-existing giant monster. They made this one up for the movie. Fortunately I really like (for the most part) the design. It has no legs. Instead it has two sets of arms: a regular-sized pair that it keeps mostly curled up against its chest, and a pair of out-of-proportionally long arms that sprout from its shoulders and are long, gangly, and have huge, arthritic-looking joints. The arms were gnarly. When in the past I've tried to imagine truly frightening, sickening monsters, sometimes I've given them arms just like those. So kudos for that. The monster was actually scary. I didn't like its face so much, though. In action it looked too, well, cartoony. But in repose it looked way, WAY too much like a 5th-stage navigators from David Lynch's Dune. Y'know, the squid-like things in the big glass tanks at the beginning of the movie. The only other thing about the film that I didn't really like was the fact that the giant monster came with smaller monsters. Look, folks, when I go to see a giant monster movie, I want to see a giant monster f**king s**t up. I don't want to have to slog through sequences of people fighting people-sized monsters. There's already a horror genre for that; they don't belong in a giant monster movie. All too often they completely take over and the movie becomes more about fighting them than fighting the big monster (Godzilla vs Destroyah, the american Godzilla movie, or Godzilla vs. Megaguirus to name a few). Also the little monsters in Cloverfield look almost exactly like the bugs from the Starship Troopers movie, only dog-sized and stark white. Thankfully, the bugs are only in two very short sequences, both of which are not much more than spring-loaded cat sequences (though the first one is actually pretty scary). Their first appearance does have very significant consequences for one character, in a shocking scenethat serves to highlight just how powerless these characters are to do anything about their situation. Indeed, the mood that Cloverfield portrayed with shocking effectiveness is the feeling of absolute helplessness. These characters are powerless. If that giant monster decides at any point to kill them, there is absolutely nothing they can do about it. There is no way for them to fight it. They've just watched one of them (one character's brother, no less) be killed and there was nothing any of them could do about it. Their lives are suddenly completely out of their hands, so they make a horrible, sad, selfish decision to strike out into the city to rescue a character's love interest. It's the only way they feel that they can regain some sort of control over their own destinies. The narrow streets, tall buildings, and dark tunnels of New York City also serve to claustrophobically heighten the tension. This monster can demolish buildings. If it's heading your way, where can you possibly be safe from it? In the end, the Cloverfield Incident is not something that four regular people can defeat. They can just hope to survive it. And knowing what we know from the opening text of the film, we know that the ending (which is remarkably similar to the ending of Miracle Mile) isn't probably going to turn out very well for most (if not all) of them. My heart was truly pounding throughout much of the film. Cloverfield is unknowable, unstoppable, and hopeless. It's fast-moving and never boring. Ultimately it doesn't really rise above its giant-monster genre, but much like Robert Rodriguez's Planet Terror, I'll be damned if it isn't possibly the best giant monster movies I've ever seen. So who cares? I had a damned good time watching it, and I have a feeling it's going to stick with me for a long time to come. 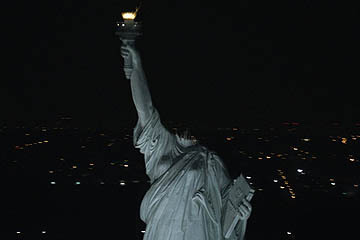 When the Statue of Liberty's head gets thrown down the street, nearly all of the people present instantly whip out their cell phones and start taking photos and videos of it. Man, I thought, if that ain't accurate to this day and age, I don't know what is.